Mardi Gras is right around the corner and you know what that means! 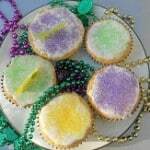 Mardi Gras is celebrated on the day before Lent and is generally a day where people eat and drink whatever they want before starting the Lenten season. While I don’t really celebrate Mardi Gras I do think it’s a fun holiday and I do like to make a little something in celebration. 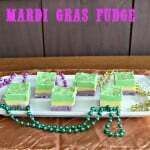 In previous years I’ve made a King Cake, tri-colored cupcakes, and a King Cake Cocktail. One thing I haven’t made are Mardi Gras cookies but that is about to change. 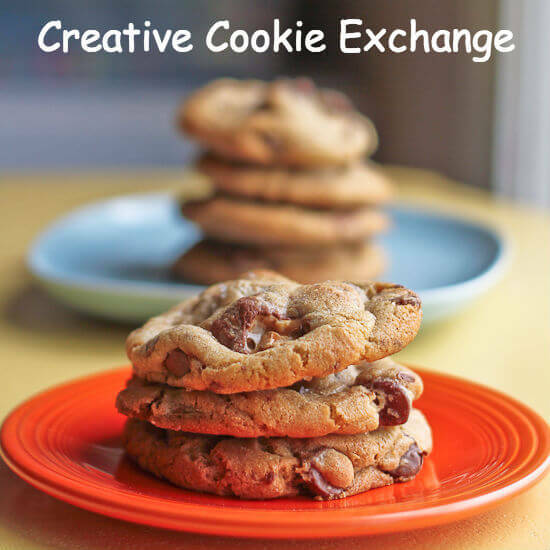 This months Creative Cookie Exchange theme is Mardi Gras Cookies. Not that I needed an excuse but this definitely gave me the motivation I needed to make a delicious cookie! 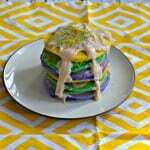 I looked high and low for a King Cake Cookie recipe. I found many different ones but nothing sounded like something I wanted to make. So I took matters into my own hands and basically took elements from 3 different recipes as well as some of my own ideas and I came up with these awesome King Cake Cookie Bars. I wanted to make a bar cookie because they are easy to make. It’s one pan, in the oven, and then it’s done. 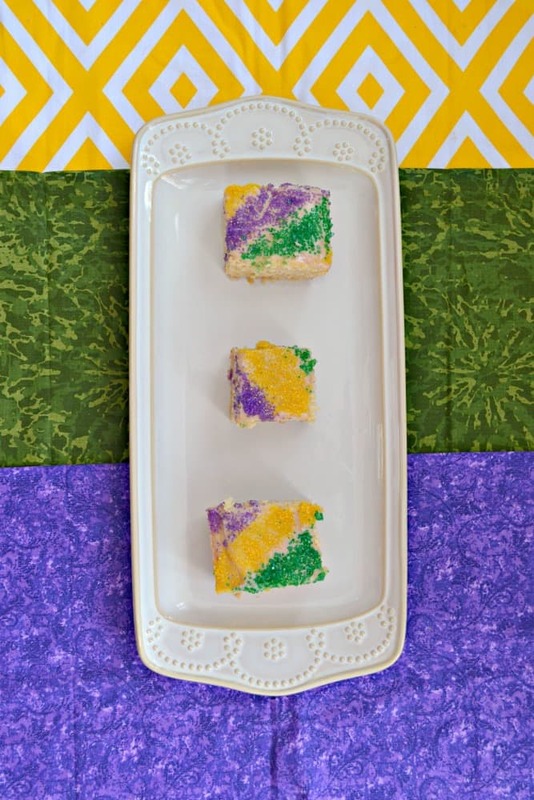 Now whenever I think of a King Cake I think of cinnamon, a powdered sugar glaze, and colored sprinkles in the Mardi Gras colors of purple, green, and gold. 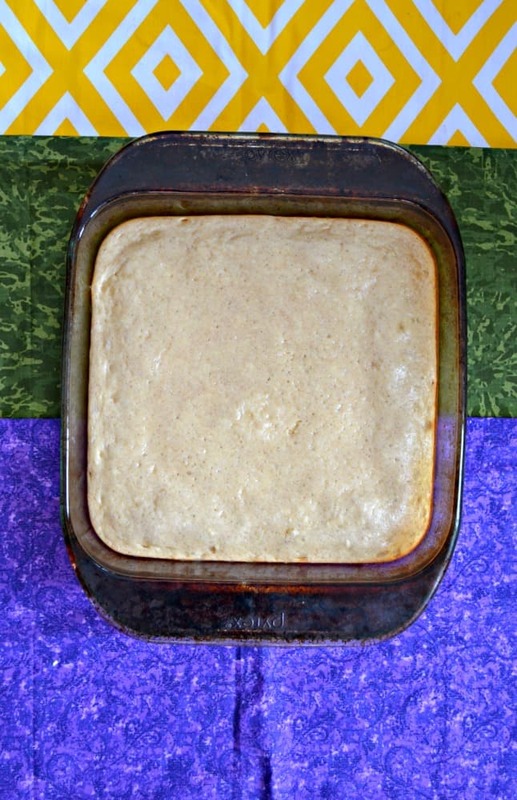 The base of my cookies is my favorite sugar cookie dough with the addition of cinnamon. I think the cinnamon gave the sugar cookies a nice kick of spice. While I baked the base in the oven I started on the top layer of the cookies. The top layer is similar to a spiced cheesecake. There aren’t too many ingredients but it’s a basic cheesecake mixed with cinnamon and nutmeg. This is poured over top of the cookie layer and then it’s all baked in the oven. I thought it might be a little too cheesecake like but as it turned out some of the cheesecake layer and some of the cookie layer melded together so it was more like a cookie layer, and soft cookie/cake layer, and the cheesecake layer on top. It was super good! But that was only the beginning. I then whipped up a quick powdered sugar glaze and poured it over top of the cooled cookies. Then I took my sprinkles and made a pretty diagonal pattern with them. They looked great in the pan and when I cut them into cookies they looked really fun! These cookies are awesome! It’s basically 3 desserts in one and it tastes similar to a King Cake. 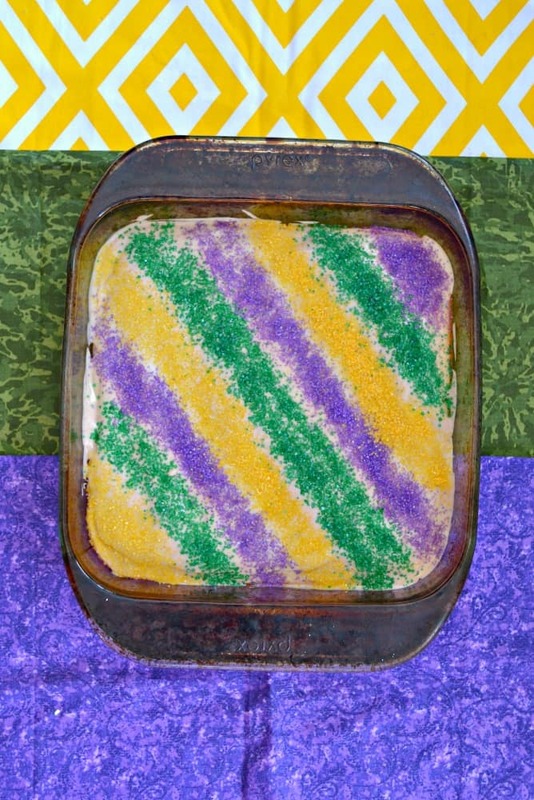 With the glaze and sprinkles on top it’s definitely an awesome Mardi Gras dessert. It’s fun, it’s festive, and it tastes delicious! 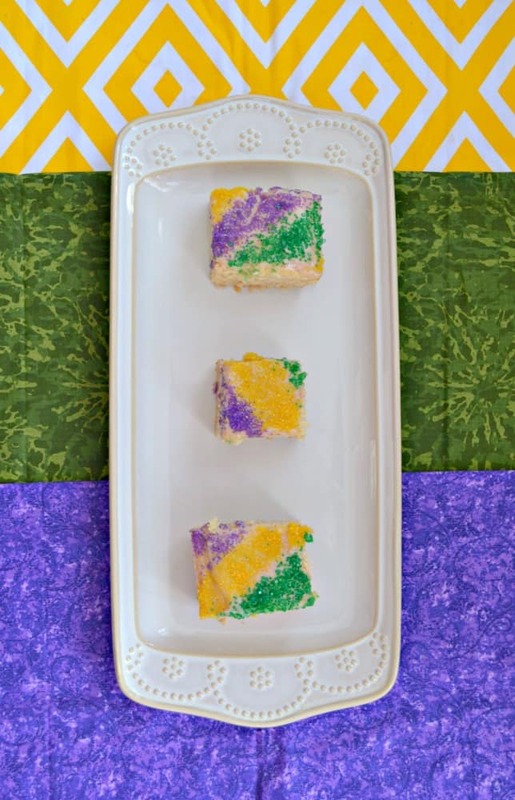 King Cake Cookie Bars have a layer of cinnamon spiced cookies topped off with spiced cheesecake and finished off with colorful sprinkles for a festive Mardi Gras dessert. In another medium bowl cream together the butter and sugar. Then add in the egg, vanilla, and cinnamon and mix well. Add the flour mixture to the butter mixture and mix until smooth. Press the cookie dough into the bottom of the pan. Bake for 5 minutes. Meanwhile, place the cream cheese, sugar, egg, vanilla, cinnamon, and nutmeg in a large bowl. Using a mixer beat on medium speed for 2 minutes or until smooth. Pour the cream cheese mixture over top of the lightly baked cookie dough layer and spread smooth. Once the cookies are cooled combine the powdered sugar and milk in a small bowl. Pour over top of the cookie bars. Sprinkle on the sprinkles in a diagonal pattern using one color at a time. Place the bars in the refrigerator for at least 1 hour then cut into squares. I like your improvisations!! Cheesecake bars sound perfect to capture the flavors of the cake! 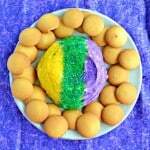 Wow, love the idea of a cheesecake layer in a cookie, and your colors perfectly capture the King Cake.